Macular Degeneration Stem Cell Therapy in Mexico at Del Prado Stem Cell Center. In some people, Macular Degeneration advances so slowly that vision loss does not occur for a long time. In others, the disease progresses faster and may lead to a loss of vision in one or both eyes. As Macular Degeneration progresses, a blurred area near the center of vision is a common symptom. Over time, the blurred area may grow larger or you may develop blank spots in your central vision. Objects also may not appear to be as bright as they used to be. 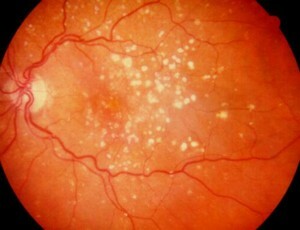 Macular Degeneration by itself does not lead to complete blindness, with no ability to see. However, the loss of central vision in this disease can interfere with simple everyday activities, such as the ability to see faces, drive, read, write, or do close work, such as cooking or fixing things around the house. How can Stem Cells Help Macular Degeneration? Adipose stem cell therapy is an alternative to help manage the complications of degenerative diseases. The stem cells have the potential to replace countless cells of the body. Adipose stem cells can be differentiated to retinal pigment epithelium cells and can potentially replace damage tissue in the affected macula. Which Kinds of cells are used in Macular Degeneration and how are they obtained? How are Mesenchymal Stem Cells (MSC) administered in Macular Degeneration? Depending of the severity of the case could be administered intravenous, retrobulbar, intravitreal.